Replacing the timing belt on your Audi, Mercedes, BMW or Porsche may not be your first priority in keeping your import vehicle in tip-top shape, but the results of a failed timing belt can be catastrophic and costly. In fact, a failed timing belt can result in complete engine failure. The timing belt is absolutely crucial to the proper functioning of the engine. The two internal engine parts, the crank and cam shafts, must work together in perfect rhythm. The timing belt allows these two parts to operate in the proper synchronicity. When the timing belt fails, the damage to the engine can result in thousands of dollars in repairs. The environment that the timing belt operates is extremely corrosive. They are made out of rubber, which eventually breaks down in the harsh conditions of extremely high temperatures, corrosive materials and mechanical hazards such as metal and hard plastics. 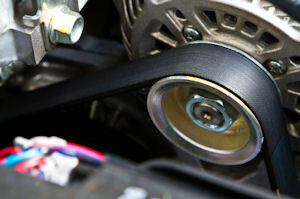 Other factors that wear down the timing belt are dust and dirt, extensive idling and stop and go driving conditions. The experts at Autoworks Colorado understand the importance of checking such a crucial part of your automobile on a regular basis. Autoworks Colorado mechanics will determine the safety level of your timing belt, and replace it at the appropriate factory scheduled maintenance interval to avoid belt breakage and serious and costly engine repairs.